Snake season - 6 tips to avoid a snake bite when hiking! You are here: Home / Advice and help / Snake season – 6 tips to avoid a snake bite when hiking! Snake season – 6 tips to avoid a snake bite when hiking! Summer has hit southern Australia and it’s snake season. Now is a great time to remind yourself of a few tips and tricks to avoid a snake bite while enjoying a hiking trip. If you are planning to hike anywhere in southern mainland Australia and Tasmania in the warmer months you should alway be prepared for a close encounter with a snake. Don’t panic, they are timid and as frightened of you, as you are of them! In this post we share a few images of Tiger snakes we (and our friends) have come across in Tasmania while we have been hiking and then follow up with some advice on avoiding a (too) close encounter of the reptile kind. 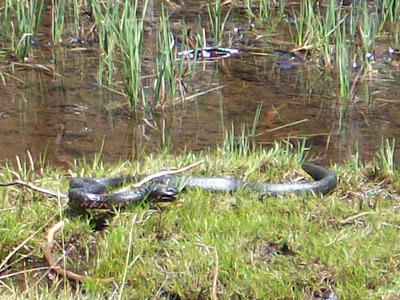 Tiger snakes are very common in many of Tasmania’s wilderness areas but are also widespread across southern Australia. For example, just last week, Tom, our son, almost stumbled on a Tiger Snake while going for a stroll at Blanket Bay in the Otway National Park! It certainly made an impression on him as he was talking about it days later! Below is a short video taken by some friends who were resting next to a tarn (small lake) in the Walls of Jerusalem area. Check it out, they were lucky enough to capture this tiger snake nabbing a frog. This is a still image of the same snake and if you enlarge the picture you may see the frogs leg protruding from it’s mouth! While we were enjoying a few days in the Walls of Jerusalem area we frequently spied this great tiger snake about 10 metres from our camp site. 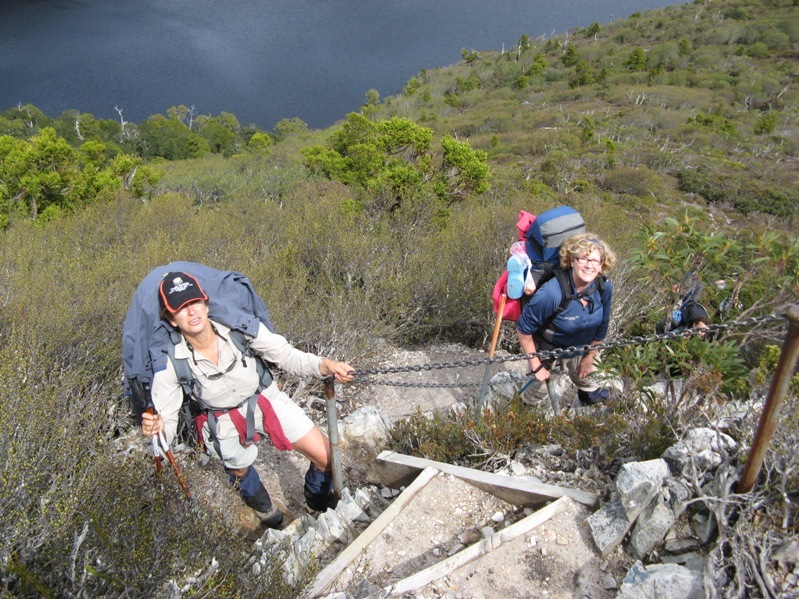 Below is a picture Colin took in February on the Overland Track. This is probably the hottest month and hence, excellent snake spotting weather. They are generally very docile and if you take a wide berth around them (Sue usually like 2 metres or so!!) you are fine. 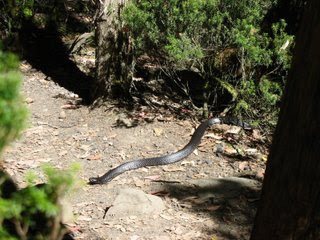 On the Overland Track they tend to lie along the track in the sun so you soon become aware of what is a fallen branch and what is a snake!! Just stop if you see one ahead, step back if you want to increase the space between you and the snake, and wait till they move away. Generally they are very timid and will quickly retreat into the bush. There is some great advice on the Parks Tasmania website regarding snakes. Step onto rather than over logs – a snake may be basking on the other side. Do not try to handle or kill a snake. They are protected species in Australia and MOST bites are caused by people trying to handle them. Avoid snakes when sighted. Don’t go and look for it, let it go and keep hiking! 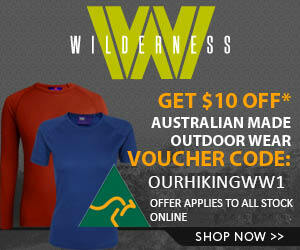 Have you aver had a close encounter with a snake while hiking or bushwalking? Got any stories you would like to share? Drop us a comment, we would love to hear from you. In my view, 2 metres is NOT a wide berth. 2 metres is well outside my “comfort zone” unless it’s a white-lipped snake. So do you want MORE or LESS than 2 metres Adam? Three would make me happier! About 15 metres would make me happier, I’d also like a 410 and a mongoose. Can you tell me what is the name of the Tasmanian snake that stops in it’s tracks an sticks it head above the long grass, looks around and then carries on its way? It was on a TV programme and I cannot remember what it was called. The programme was not on the 1st of April. I have just returned home from walking the Great Ocean walk. And what a fantastic walk it is. During this eight day walk I saw many snakes sunning them selves on the track and while most disappeared into the grass as soon as they sensed my approach on one occasion the said snake that was sunning itself on a short bridge over a creek took some convincing that it should vacate while I passed. Actually it took a few sticks followed by larger and larger stones until it got the message. But the snake encounter that did rattle me (sorry about the near pun)was when I bent over to take a photo and immediately felt something drop onto my back then fell to the ground and disappeared into the grass before I realized what it was. I think it was a small Eastern Brown snake that must have been sunning itself on the embankment prior to me disturbing it. Really pleased you enjoyed the GOW and had fun with the local wildlife……..
Good to see you took your time. 8 days would be magic. To prove point one for you – Early this year I had a VERY close encounter with a snake – I was out walking on my own in the bush west of Brisbane and stopped for a loo break. Even though I know better (and I am usually the snake spotter ! ), I jumped off the side of the track near a log in my hurry, felt something strike my foot and looked down thinking it was a branch. I saw something long and black slither off, and then saw the two beads of blood welling up on the side of my foot ! Fortunately I ALWAYS carry a snake bite kit of three large compression bandages which I applied, sat real still to slow down my heart rate and called someone to let them know precisely where I was on my route. 40 minutes later I was feeling no effects so I walked the last 7 kms out to a vehicle track where my lift was waiting. Later that evening and the next day I suffered some bad aches and nausea but recovered quickly without need for antivenom. Apparently it was a red-bellied black. NO … my mistake wasn’t walking alone or wearing sandals as I was – I have done this hundreds of times. MY stupid mistake was leaping off the track without respect for the creatures of the bush. And this experience reinforced two other things for me – always tell someone your plans and leave a map, and always carry compression bandages !! That would have been a bit scary in the evening and the next day. Hi, wonderful tips. Thank’s for sharing it. Hi Frank, just Saturday gone 1st December I was hiking on my own in the Bunya Mountains. Only about 20m into the walk a Red Bellie Black was about a foot in front of me heading in the same direction; however crossing the path on a 45 degree angle. Scared the bejesus out of me. It took me a second or so to realise what it was before I officially stopped. Close encounter that was. On the way back I thought I would take my time as the whole walk I was weary of any noises. I was held up for about 5 minutes as the same bloody snake was their still. A couple I overtook a little earlier on the trip caught up and were over the moon they were able to witness it. I warned a few other hikers and a local couple who have had the same reports however they have not bothered to place a sign to state that it is it’s nesting area. It had about 4 s bends very closely knit as it slithered away. Big fellow. Two big tiger snakes on the trail up to cathedral rock (Mt Wellington) just where the trail goes down onto the river bank. Their hollow is there so best not to stop and sit on the way back down! I really enjoyed reading the snake encounters above!! Coming from NZ where we have no snakes, its hard for me to come to grips with hiking etc in Aussie. However I have been invited on a prospecting trip for 7days out of Cairns starting next week. Is it possible for someone to please advise me where to purchase snake protection gear in Cairns? Many Thanks snake scared Kiwi. Well, I’m a kiwi who’s lived in Aus for 8 years and has spent a bit of time in the bush. Never saw a snake before, until last weekend. We almost stepped on what looked like a eastern brown then saw a red bellied black soon after. This was up Mt Riddell, VIC. Scared the heck out of me and I’ve been doing snake research all week. Brownie seemed to be totally not scared of us, but it was morning and the sun had only just come out, so perhaps he was sleepy. Anyway. Lesson learned from this is to walk slower and pay more attention to the ground in front. Although he did look a LOT like a stick! I’m planning my four time in OZ and my first time in Tasmania . In my long travels I had had only a not too close encounter with a snake but my fear is very big.!!!! I hope not to have other encounter but I like hiking so I think to buy gaiters. It could be a good protection? October/november is a snake season in Tasmania?